It is Fermilab’s policy to provide small businesses with the maximum practicable opportunity to be awarded purchase orders and subcontracts in support of the laboratory’s mission. Fermilab acquires goods and services in a manner consistent with the Department of Energy’s small business policies. This includes subcontracting with Small Businesses, Small Disadvantaged Businesses, Woman Owned Businesses, Veteran Owned Businesses, Service Disabled Veteran Owned Businesses and Historically Underutilized Business Zone certified businesses. 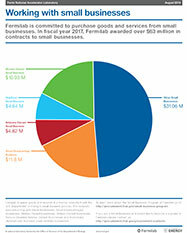 Fermilab Procurement is committed to supporting small business. In Fiscal year 2018, Fermilab awarded over $58 million in contracts with small businesses.